The following is a post from a friend of mine (Art). I didn’t write this blog, but had a few responses to it. We had an interesting dialog on it as we approached the topic from different angles. What do you think? I was talking to my little brother the other day. My little brother does not use myspace and he is not computer savvy at all. He really needs to get with the times. Well, let me take that back. He is a youtube addict. My little brother was talking to his friend about life, and they got on the conversation about my myspace page background picture. His friend also grew up with us in the Projects. His friend said, ” I see your brother myspace page with Arlington Courts in the background. He needs to let it go. He got the picture up there like Arlington Courts still exist”. I just felt that statement was strange. But I am going to address it, as if I have to justify myself to anyone. This is my first time using this blog feature so; I figured I would talk about something. My whole reason for using Arlington Courts (a Dayton Metropolitan Housing Projects where I was raised) in my background is symbolizing a remembrance for me. That is exactly why it is in the background because it is apart of my past that I do not want to forget. It is a constant reminder of where I came from and do not want to adventure back there to live or in any other low economic disadvantage community. That part of my past continues to humble me and have contributed to my empathy I have for people because I was once among those individuals living in the Projects. 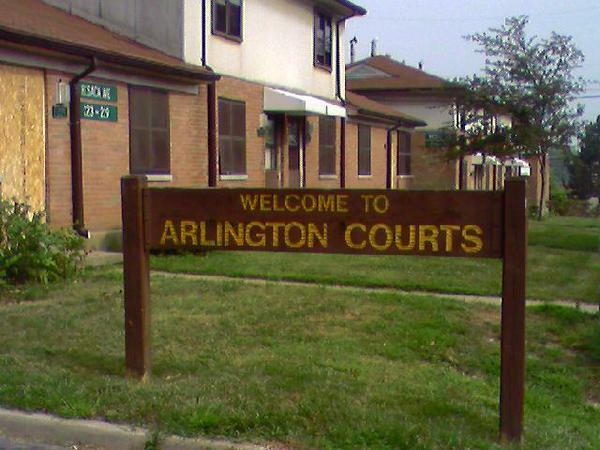 My background picture of Arlington Courts is by know means an indication that my neighborhood is the hardest or roughest. For me, growing up in Arlington Courts was not all bad. Of course, I could not wait to leave my treachous surroundings. I made some of my closest childhood friends in the Projects. To be honest, before the crack invaded my neighborhood we were a very close community. At least in the small area where my apartment was located. I can remember an older woman who uses to watch over my sisters and I. She served as a grandmother to us. I can remember a neighbor telling me, “Boy you betta get away from the crap game! You ain’t got no business being up this way anyway”. These memories I hold close to me because the past is not something I want to revisit but it is a place I do not want to forget either. Those same memories are tainted with losing my childhood friends to incarceration and murder. I witness my first shooting and murder in those Projects. This is something I wish for no child to witness, especially at the early age that I viewed it. I could not even recognize the circle of violence that was around me until I went off to college at The Ohio State University (I used “The” for the politically correct people). When I came home to visit I had the opportunity to view my world as an outsider. I started to examine the dynamics and the aesthetics of my community. Of course I knew things was bad and we was poor, but now I honestly knew to what extent. I know it sounds naive, but I guess I was so engulf into my own world. I was truly blessed to have the mother that I did growing up during those times. My mother was a woman who survived and lived through segregation and the Civil Rights’ movement. Hearing her tell the stories about how she was escorted to classrooms by the National Guard, and fearing for her life because of bomb threats. She told me, “You may have been born in the Projects, but the Projects was not born in you”. I am not on here to boast about my educational accolades but I have my Masters of Public Administration degree, and considering going to school to receive another Masters or a PhD degree. I came from the bottom, the dirty, place where the odds are stacked up against you and by the grace of God I have moved forward in life. I have along way to go because I am not close to finishing my career or personal goals. So, I have not arrived but I have come far. I was watching a show one day about the retired or free agent guard, Penny Hardaway. He was showing his extremely large beautiful estate and in the middle of the hall on the wall, that was on the second floor, hanged a black and white picture. It was a picture of a shack that was damage and looked condemned. This was the house he grew up in and it was the size of his bedroom in his estate. He had it as a reminder of his past and growing up with his grandmother. In addition, Ludacris still has his 1993 Acura Legend that he drives from time to time. Ludacris said he keeps him grounded. The background picture of Arlington Courts is my version of a damaged shack and that 1993 Acura Legend. Your past does not have to predict your future. Yo big ups for everything you put in this blog. I got a very similar question when I rushed back to Springfield to take a photo of my old projects before they tore them down a couple years ago. Your right it was, is and continues to be humbling. It serves as a reminder of where I’ve been, what I’ve been through, how far I’ve come, and where I’m going. Strangely enough, it wasn’t until I came back from “The” Bowling Green State University that i realized we lived in the projects. It wasn’t until we completed the Masters of Public Administration program that I realized the social-economical impacts of my neighborhood. It was just home to me, my neighbors were like family. And despite the fact that I never resented where I lived I always knew I was leaving, probably never to return. So I sacraficed, over and over as i’m sure Art did, so go ahead and boast on your accomplishment, you and I both deserve to do so considering we were, in most people’s eyes, just a couple of Project kids!! I am going to play devil’s advocate here Bertha just to make this interesting. I see what you are saying, and agree with you (and the other post) about respecting your past, and how it keeps you humble. However, I want to approach this from a different angle. I have some photos of my old home (interior & exterior), along with my old neighborhood, old schools, etc. I took them so I could show my kids where I was raised, and like you stated, to remind me where I came from. Though not the PJ’s, you know where I lived and my situation (single mom, low income, etc.). Getting a fresh pair of J’s was out of the equation in my household because of our finances. Coming from that environment, I worked my tail off so that my kids don’t have to hear gunshots at night, or worry about glass on their backseat from someone constantly breaking into your car. The fear that a geeker will run into your house if you accidentally forgot to lock the door on the way to the grocery store. All that to say I will never forget where I come from, but on the flip I don’t want a big ol visual to remind me of some of the hard stuff we went through. I heard somewhere (and I am probably misquoting), but this guy was talking about holding on to things, and how sometimes that thing (whatever it may be) visually keep us in a mindset from that era; thus preventing us from moving forward. It is a double-edged sword Art. I saw that Crib’s special with Penny, and I like how he had his home framed. But on the flip, Penny is on a financial level probably none of us are on (YET). My point is, once we get to that level, then yea that is cool. But at this point, I don’t want a photo up of a depressing era of my life (especially with some of the trials we have been going through). I want a photo up of where I am going. I want a photo up of a 500k home. I want a photo up of a Yacht I intend on purchasing. I want a photo up of my bank statement showing all of my children’s college funds are paid in full already. I want a photo of some diamonds I want to buy for my wife. I want a photo up of some big boy toys I plan on purchasing. I want a photo up of some countries I never visited. You feel me? So from that angle, I can see your brother’s friends point. I know you, and I know your intentions behind the wallpaper, but look at it from another angle. To others looking at your page, especially since it is private now (cause you big time), it makes it look like you are glorifying the hood. Now reading your blog, people know you aren’t…I am just giving you the alt perception. Especially with that classic “The Wire” pose you got jumpin off. Lol. Rome, that is very interesting. You know I thought about that somewhat. In the sense, of my profile being private, well most or over 90% of the people I accept I know personally. Now, my little brother friend was one of those people who I accept as a friend to my myspace page. So, I say that to say-I am not really concern about the rest who visits my page and cannot access it because of my privacy setting. Honestly, this is a reminder for ME and I am the person who suppose to get it, not everybody esle. So, it is more personal than anything. It sounds cruel but I am being honest. Some perspection we/I cannot control, espeacially if we do not know that person or in this case if he/she do not know me. With that said also, they could always send a friend request if they are curious because I might accept them if I do not know them. Now, as far the picture-it just depend if you want to look at the water half empty or full. In my opinion, I am looking at it half full. In the sense of motivation and fueling my drive, hunger and desire to move forward in life. When I was in graduate school I got my first and only C during my process of trying to be admitted to Urban Affairs’ program. I could not afford to get another C because then I would not be about to get in the college. I was working full-time and going to school part-time, plus paying for the classes out of my pocket. I was living at home with my mother and the job I had was a factory job that was paying me peanuts, so all of my money is going to tution. That first C I got, and the only one I received, I put it on the refridgator for I could see it every day when I walked pass or went to get something to eat. That was my motivation and of course it was not a positive grade but it kept me focus. I write down goals evey year and post them some where in view for I can read them every day. I make every goals have a deadline and of course I do not reach all of them but I continue to aim for them. This is another way I stay on course to reach my goals. In the end, Rome I know what you are saying. I feel you, bruh. I just like being difficult though. I do think it probably depends on the person. Forgive me for the grammar and spelling mistakes. I will start revising my blogs, but right now I am in a rush and just wanted to respond. Man Art, I think you nailed that one on the head. We been together (grew up) since like the third grade. Running through the AC, hoopin up in the AC or down at McCabe. The visual of the AC motivates me. Even though I didn’t live in the AC (I acutally lived a block down the street), Art you know that I was up there with you like I lived there. The visual of AC motivates me. The AC to an extent grommed us. It gives me motivation to want to expand. I would not trade growing up the way we did for nothing. It shaped us…it’s given us the morals we have now. If we lived anywhere else….we probably wouldn’t have had the priviledge to meet a Mrs. Calhoun, or Mr. Reese, or Mrs. Collie…you feel me Art? The picture of AC gives me good memories also. It’s not about letting it go, it’s about remembering….reflecting and being thankful that I came from a place like that. Like you said Art, the AC wasn’t always bad….we had a chance to forge some lifelong friendships. I am so proud of you. I couldn’t have said it any better. And you are right, when you are in the midst of the projects, it is not until you leave that you notice the desolation (I think that’s God’s way of helping you survive). Our mother also used to say that if you do not remember the past, you are doomed to repeat it…….ALWAYS remember the Courts. Maybe my point was misconstrued. I may have come across like one who wants to forget where he comes from. I didn’t mean it that way at all. It is very important to know your history and past to try to improve on mistakes, and make sure you don’t repeat it. Believe me, I would never speak about someone ignoring where they come from. What I was speaking on was people who STAY focused on where they come from. People who just can’t let stuff go. People that constantly sit around talking about the past, and trying to recreate it. Do you feel what I am saying? How this (photo from past, etc.) may work for you Art (and others on this blog) we can’t honestly say it is healthy for everyone. Staying in the past, or reflecting on the past “constantly” does not allow certain people to grow whatsoever. They stay in the same mindset, and are on the same foolishness. Just real talk. The people on this blog are educated, but let’s be real…we all know some people who can’t let the hood go. Art, you and I know one personally bruh (lol). This cat is so intent on staying true to his hood that he still lives and breathes the same hustling mindset. He reflects on it so much that it prevents him from moving to that next level that we strive for. The reality is some people look at things from their past, and can’t get past it…thus staying stuck in that mindset. Brief story. My wife is from a small town, and she had this family member (who still stays in that small town) come visit. Backdrop – they are building some really nice homes near our house. So as my wife and her people were driving around our neighborhood, this particular family member made a comment like,”This is not realistic. Real people like us can’t live in homes like this!” That comment threw me back. This fam member is a college graduate AND working on her master’s. She is very book smart, however her mindset is still constrained by their little hometown. I am a man of faith, and truly believe that you have to visualize where you are going. All that to say if you can’t see yourself there, then you won’t be there. If you can’t see yourself in a house like that, then you won’t be in a house like that. If you can’t see yourself driving a Rover, then you will never drive a Rover. You will only live as good as you can see. What’s the Word say? Without a vision, people perish (Prov 29:18). Sometimes staying in our past clouds our vision, and prevents us from moving forward. I guess my point (summed up) is I think it is good to reflect, and use it to propel you forward if that works for you. I’d never tell anyone to forget their past. But what I am saying is if we (blk folks) always approach life from the standpoint of focusing on what we didn’t have, then how can that help us grow? I am trying to break that mold, and achieve goals higher than my grandparents and mother. Maybe to do that, I have to develop a new way of thinking. I always reverence where I come from, but from a visual standpoint, I prefer to focus on things I want in life, versus times that were bad. I am a proponent of the power of your words, and speaking things into existence. If you constantly talk about being poor, not having anything, then guess what? You won’t. I speak healing and prosperity and wisdom and discernment. I speak blessings and momentum and favor. I love my past, but I am not trying to go back there, nor do I want my kids to have to experience 1/8 of what I did growing up! !